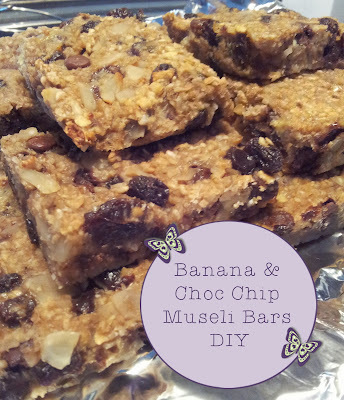 I have to admit I do like to snack and chocolate is my weakness, if you are like me and are looking for healthy snacks but to help with the chocolate craving give these easy to make Banana and Chocolate Chip Muesli Cereal Bars a go. These bars are also a way to use up bananas you might have thrown away because their skins went a little brown or they got a bit bruised. *Mix the ingredients together well and then add the 1/2 cup of dark chocolate chips and the 3 tablespoons of sunflower seeds. *Line a baking in with baking parchment and spread the mixture to about 2cm thick. *Once cooled, remove from the tin and cut into the desired size bar and store in an air tight container. I usually cut them into 2" squares. When I have made these cereal bars I find they need to be eaten within a week because of the banana in the mixture. If you had school children these would be a great snack to whip up ready for their lunch boxes the following day.